Pioneers in the industry, we offer cotton blue saree, cotton black saree, cotton saree, cotton border saree, orange cotton linen sarees and cotton linen sarees from India. Clients can avail the offered range of Cotton Blue Saree from us, in various patterns and colours. Our offered sarees are designed with the aid of soft quality fabric and modular technology in compliance with set industry standards. The sarees offered by us are tested on well defined parameter, in order to deliver a defect free range. 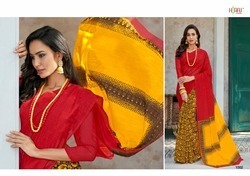 Apart from this, clients can avail these sarees from us at affordable prices. Owing to our expertise in this domain, we are engaged in providing an array of Cotton Black Saree. These sarees are designed using supreme quality fabric and technically advanced tools under the guidance of skilled designers to meet the set market standards. In order to meet the precise needs of clients, we offer these sarees in different colors and designs. Widely demanded to be worn in functions and parties, the entire range is tested on various quality parameters to ensure its flawlessness at users' end. Leveraging on our vast industry experience and knowledge in this domain, we are devotedly engaged in offering wide assortment of Cotton Saree. The offered sarees are precisely designed with the help of premium quality fabric and advanced machines in compliance with set industry standards. These sarees are provided by us to our prestigious clients with multiple color options at industry leading prices. We hold expertise in offering an excellent quality Cotton Border Saree. These sarees are tailored using best quality fabric sourced from trustworthy vendors of the market under the guidance of skilled professionals in compliance with latest market trends. We offer these sarees in different colors and patterns keeping in mind the varied needs of the clients. Enhance the look of the wearer, our offered range can be availed by our clients at rock bottom price. We are offering a varity of printed linen cotton sarees for every occassion. We hold expertise in offering an excellent quality Cotton Linen Sarees. Stylish Red Cotton Linen Sarees. Stylish black cotton linen saree. These sarees are tailored using best quality fabric sourced from trustworthy vendors of the market under the guidance of skilled professionals in compliance with latest market trends. Amazing flower printed Beige Cotton Linen Saree. Our offered sarees are designed with the aid of soft quality fabric and modular technology in compliance with set industry standards. Beautiful blue linen cotton saree gives you the elegant look for a semi-formal occassion. Stylish printed orange and white coloured linen cotton saree suited for causal occassion. We are offering best quality printed linen cotton sarees suitable for causal occassions.